Happy holidays, friends! I hope you all had a lovely Christmas and are enjoying a bit of a relaxing break. We had a fairly low key day, which was perfect. Lots of delicious food, cider, sunshine and a wild game of Cranium late in the evening which lead to tear-filled laughter and me trying to do a convincing 'blue steel'. It was pretty great! As a little holiday treat for you all, we're offering 30% off everything in the shop until January 2nd. 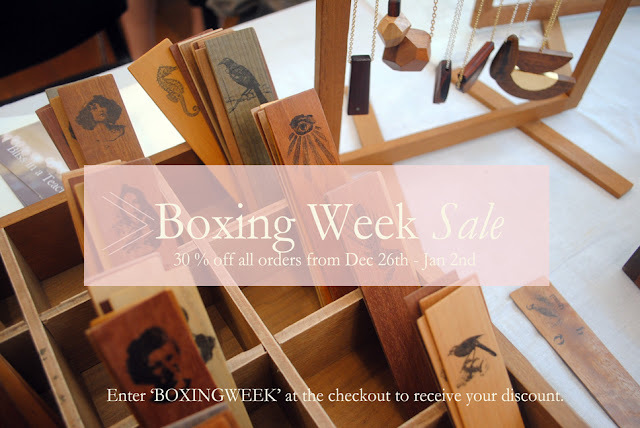 Just enter 'BOXINGWEEK' at the checkout to grab your discount. We'll be closing up for a few days after the sale ends to tidy up a bit and release our new jewellery collection (more on that later). We'll also be having a special Facebook sale around then to clear a bunch of stuff out, so make sure to head over there and like us if you haven't already. Have the best New Years!